The Coffee Collective Blog: Close to 40% less CO2 emissions from a cup of coffee in our shops! Close to 40% less CO2 emissions from a cup of coffee in our shops! Since 2010 we have been buying shares in Middelgrundens Vindmøllelaug (www.middelgrunden.dk) who owns the mills standing in the waters just outside of Copenhagen. Now we have supplemented this with buying electricity from the supplier Vindstød, that delivers electricity which is 100% wind mill based (vindstoed.dk). We are therefore very proud to say that now all the electricity we use at the The Coffee Collective will be produced on wind mills. 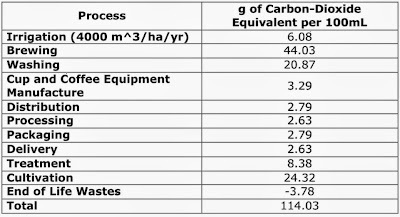 In life cycle assesments of the coffee production, the part of the production with the highest energy consumption på mL of finihed coffee brew is often found to be the actual brewing. 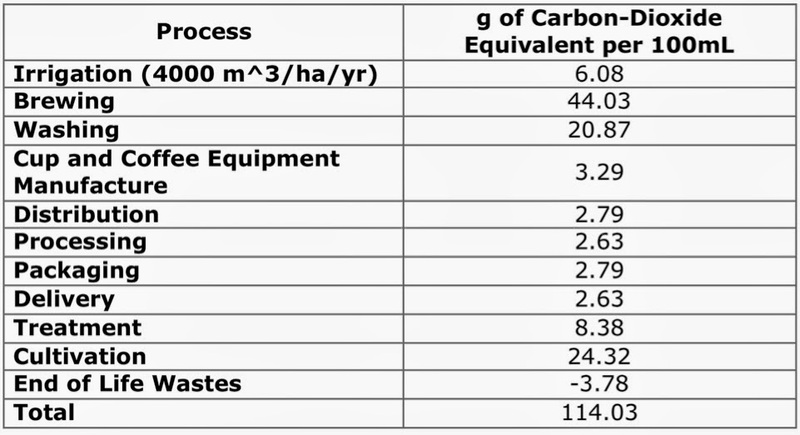 See the following table for details in terms of CO2 equivalents. The primary consumption of energy in the brewing process is the heating of water which normally will be done by using electricity. Therefore by switching our electricity source to wind mills we have reduced the total CO2 emissions pr. cup of coffee by almost 40%!